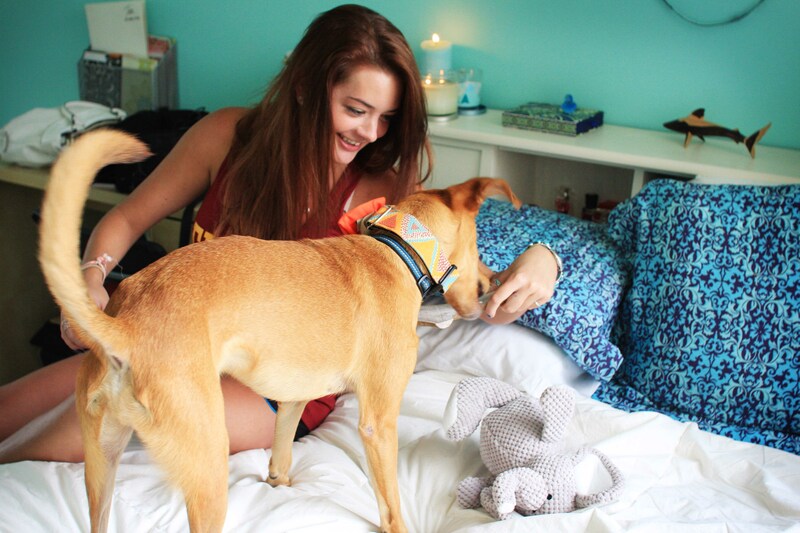 I was thrilled when my best friend Sarah told me she decided she wanted to foster a dog. It would be an exciting experience, as Sarah’s never had a dog before. She brought home her first Homeward Trails foster dog on Friday night! Jack Rabbit is a whopping twenty pounds of all legs. At only about a year old, he seems to have his house manners perfected (he was adopted as a puppy and recently returned because of a divorce). I would honestly say he is close to ideal for a first time dog owner. House broken and crate trained, Jack minds his own business while he’s in the apartment and spends his time either sleeping or prancing around with a toy. Because Sarah and I are so close and I’m the one with the doggy experience, I immediately assumed the role of FosterAunt. 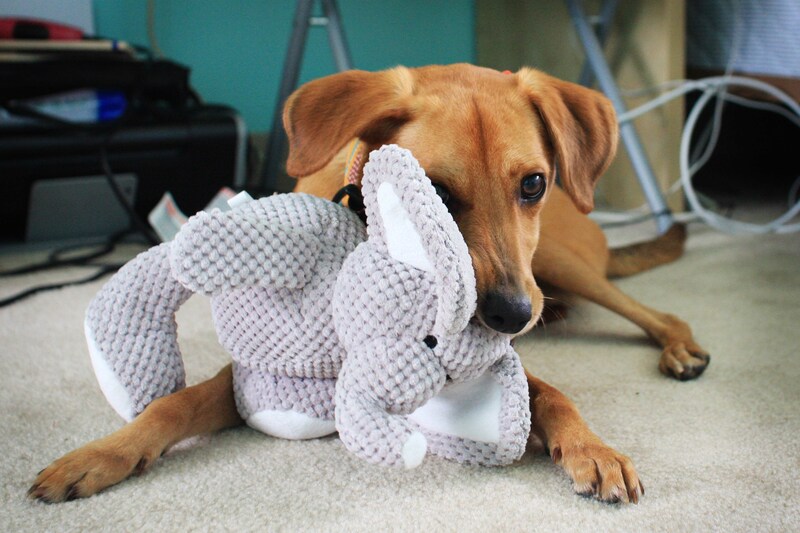 Like any good Auntie, I showed up to the first time meeting him with many gifts in hand: a kong, an antler, and a stuffed elephant. He loved all of them! 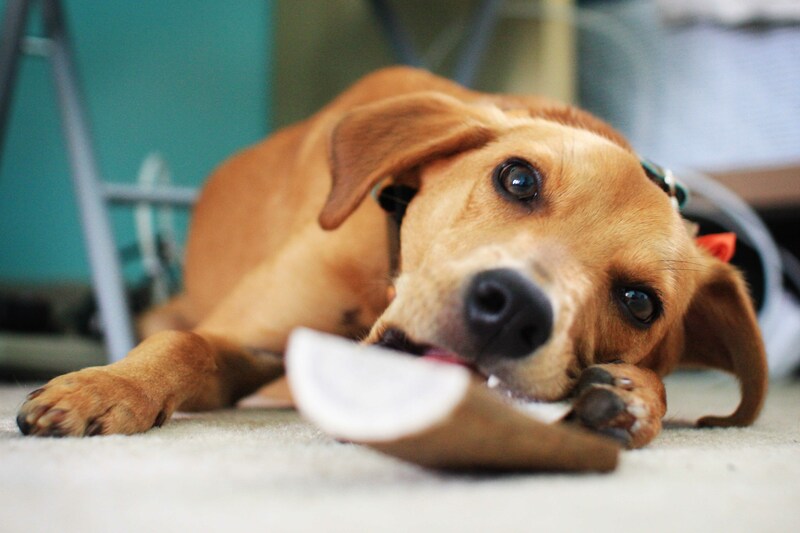 He actually plays with both by himself – especially the antler – keeping him busy for long periods of time. Like with any new dog, Sarah and Jack are still getting to know each other. Sarah is eager to learn about caring for dogs so I am telling her everything I know about basic training, interpreting behavior, etiquette for meeting other dogs, etc. She’s being patient and understanding when working with him, and he is teaching her what it means to be responsible for something another living thing. I’m sure he’s going to get scooped up in no time, and she’ll learn the bittersweet heartbreak of having to say goodbye. But then hopefully down the road she’ll get a new one, realizing again the satisfaction of saving a life and making a bond with a new dog. For now, we’re all enjoying have a dog around again! This entry was posted in Dog talk, Photography, Rescue/Humane Society and tagged first dog, fostering, Homeward Trails, Jack Rabbit, learning, mutt, new foster. Bookmark the permalink. That’s great that your friend is opening herself up to fostering. 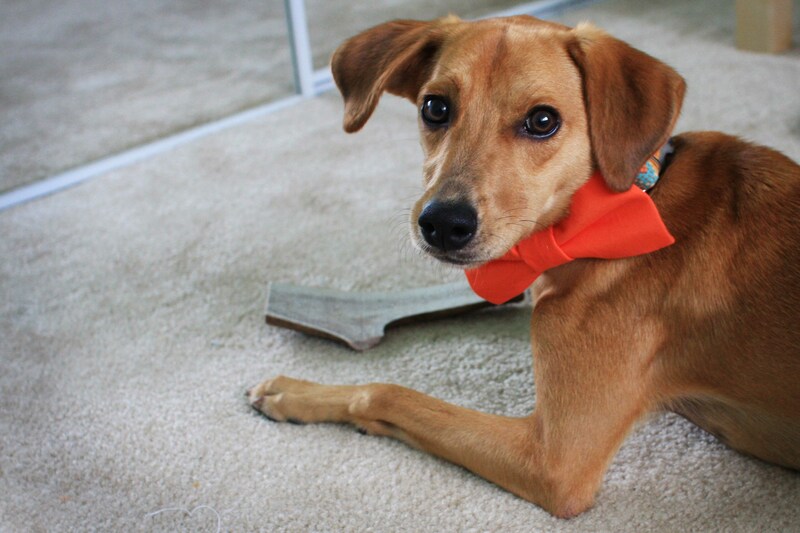 That pup is so cute and it sounds like he’s got the right personality for a first time foster! Kongs and peanut butter are lifesavers. :) Tell her to check out Acadia Antlers for all natural moose antlers. Theyre really nice people with top quality products!! Jack is just too cute. I am so glad her first experience is such a positive one! His previous owners must have had a hard time letting him go as he sounds like such a fun little guy. Congratulations to your friend for taking the leap! Thanks for all the love guys! It still hasn’t been a full week and I’ve already learned so much. Your advice has been spot on and the little Jack monster appreciates all the help.